Routes are broken up into three categories: Easy, Difficult and Expert. Terrain and length of ride will be tailored to suit the group or individual's wishes. These routes are for anyone wanting to get out of Granada for a day, try some of the local trails (not to mention tapas!) and have a non-strenuous yet active experience. These routes are for bikers who ride regularly, are in good physical condition, enjoy longer climbs and steeper descents. 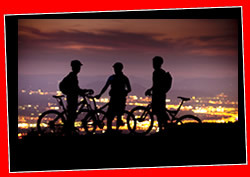 These routes are for mountain-bikers wishing to ride the best trails on offer in the Granada area. These riders should be fit, technically advanced and seeking adrenalin. We know you want to visit the beach on your trip to Granada and that's why we have this one for you....How about riding from the highest peak of the Sierra Nevada to sea level?